Halloween is a day when toilet paper is sometimes used for things other than its normal function. Here’s another application: time travel. OK, not actual time travel, but a roll of toilet paper can be used as a really cool educational device for demonstrating geological time spans. The Earth is about 4.6 billion years old. This is a very big number so it’s hard to relate to this in terms of our personal experience with time. Writers and teachers of Earth and space sciences make use of analogies to help students comprehend geological and cosmological time spans. One well-known analogy is the cosmic calendar, in which the age the universe (15 billion years, give or take) is considered to be one year, with the Big Bang occurring at midnight on January 1. On this scale (475 real years per cosmic calendar second), the solar system forms on September 9, life emerges on September 30, and early humans arrive at 11:50 pm on December 31. The whole of recorded human history (around 10,000 years) takes place in the final 21 seconds of the year. Astronomy Notes (great web site!) has a nice explanation of the cosmic calendar here. But my current (ahem) bathroom reading is The Ancestor’s Tale by Richard Dawkins. This book is a backwards journey through time from present-day humans, through all of our tale-telling evolutionary ancestors, to the dawn of life on Earth, around 3.4 billion years ago. I was having some trouble grappling with the various spans Dawkins talks about, so I looked up “time scale analogies” in Google. That’s where I found the toilet paper analogy for geologic timescales. Jennifer Wenner has a great explanation of this classroom demonstration here (and here is another version). It requires a 1000 sheet roll of toilet paper, some time for preparation, and a delicate touch (for unrolling, labeling, and re-rolling the paper). I won’t repeat Wenner's explanation here (she even links to an Excel spreadsheet that defines the key milestones and their sheet positions for marking, and allows you to scale to fewer sheets if the budget doesn’t allow for a full 1000 sheet roll). I haven’t tried this myself, but 100-some meters of unrolled toilet paper is striking even in the imagination. Early bacteria start on sheet 739. Insects arrive on sheet 87. The dinosaurs start on sheet 46 and end on sheet 14. What about us Homo sapiens? We never make it off the first sheet – all of human and proto-human evolution fall within two-thirds of the first sheet. Human history takes place within the first 0.02 cm (0.01 inch). Whoa. My brain is in a heavy pre-trip mode, since I'm heading back to India on Friday for a week of seminars and customer visits in Bangalore and Delhi. So I'm really focused on work, finishing up some projects and preparing for my presentations. My inoculations and new 10-year India visa are all set, and I've got my anti-malaria prescription and my "just in case" antibiotics. So I'm ready to roll and in my spare time, of course I've been reading a travel book about... Mars! When I wrote about planetary scientist and artist William K. Hartmann last week, I got out his Traveler's Guide to Mars, which I've had for some time but had previously only browsed. So I started reading it, and it's great! Dozens of pictures from Viking and Mars Global Surveyor; brief and nicely written chapters focused on key features of Mars and their history and meaning; and a series of personal history "side bars" called "My Martian Chronicles" (which date back to Mariner 4 in the early sixties - Hartmann got into the Mars space probe business at the beginning). 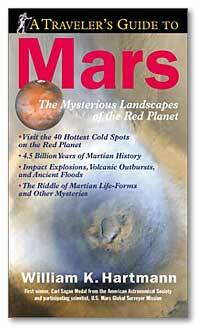 This is a wonderful book for really getting to know Mars. Although Mars Reconnaissance Orbiter will be producing higher resolution views of Mars over the next few years, you still need to know the "lay of the land" to put it all in context, and this book is perfect in that role. I finally got myself an Apple iPod - a tiny, silver, 4 gigabyte Nano, holding about 1000 songs. I've got about 9000 songs on my PC at home (mostly ripped from my own CD collection, though I have also bought quite a few songs from iTunes and eMusic), so filling up an iPod is pretty easy. I've loaded about 800 songs in just a couple of days. I could have put my whole music collection on one of the hard-drive (video) iPods, but I can get by with 1000 songs - it forces me to be a little selective and helps to assure that whatever pops up in shuffle play will be something I like. Although I bought iPods for both of my daughters ages ago (to avoid charges of child abuse), I've resisted getting my own, a fairly rare case of "do I really need this?" 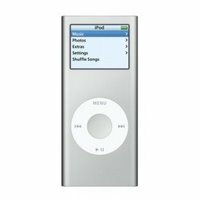 With songs on both the computers I use and a small 512 MB (~125 songs) iRiver MP3 player for use in the car and on planes, I haven't been lacking for music. But the iPod's interface is just so slick, and shuffling from 800-1000 songs is nicely unpredictable (Led Zep, Julian Bream, Joni Mitchell, Papas Fritas, The Maggies, some Indian music, Bright Eyes, Mindy Smith, me, John Mayer, a song from the amazing show Wicked, Beatles, etc.). I've even subscribed to a couple of free weekly podcasts from NPR (public radio), one a science show (Nova scienceNOW) and the other a weekly live classical music show from WGBH. I feel so modern. The Martian winter is twice as long as Earth's winter, and this seems to be taking its toll on one of our friends there. This is a sad story but it needs to be told. Thanks to the Bad Astronomy Blog for pointing it out. I saw the recent World War I flying film Flyboys in a second-run theater yesterday, and I really liked it. Based on a true story, it follows a small group of young American men who volunteered in 1916 to fly with the French as members of the Lafayette Escadrille, before the US had entered the war. It has some of the most amazing aerial combat footage I have ever seen, a seamless and nearly dizzying blend of real aerobatic stunt flying and incredible computer generated digital effects. The script, atmosphere, and most of the acting are quite good as well, giving a good feel for what it must have been like to fly and fight in these underpowered and hard to control early airplanes. Flyboys is the first film focused on WWI aerial combat in over 30 years. It was released on September 22 and doesn't appear to have done too well at the box office, sad to say. I'm glad I got to see it on a big screen but I'm also looking forward to the DVD release (1/1/2007) in hopes that it will include a good making-of special with behind the scenes material on the aerobatic flying. In the meantime there's a very interesting 62 page text-only document of production notes (PDF) available at the MGM web site. The picture above is not from the film - it's one I took in 2001 at Old Rhinebeck Aerodrome in New York - one of the few places where you can still see some of these WWI warbirds, many on the ground and a few in action. Mars awaits us; a living world in kit form. It has the right orbit, the right seasons, the right day; it has a ready-made atmosphere; it even has hidden oceans. 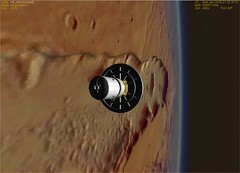 Mars needs only a touch of magic catalyst and it will explode into life. That catalyst is us. 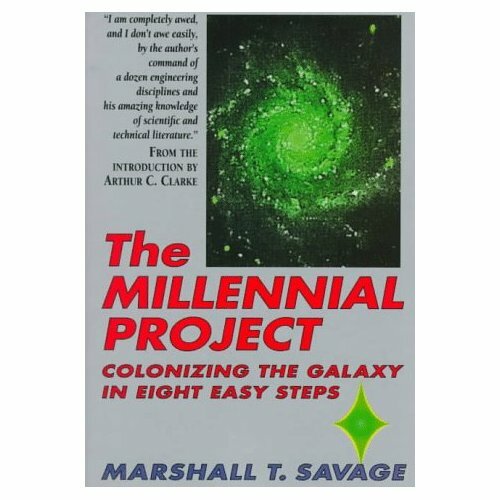 That's a super-optimistic view of colonization and terraforming of Mars, from a book that is generally super-optimistic about the future of humankind in space (its subitle is "Colonizing the Galaxy in Eight Easy Steps"). 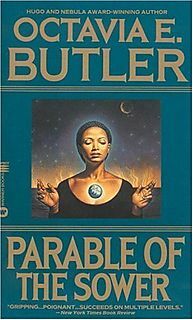 Published in 1992 and 1994 (1994 paperback has an introduction by Arthur C. Clarke), I bought a copy a few months ago and have kept it nearby for occasional browsing. Savage's scope and vision are truly amazing, even if many of the things he proposes would not be exactly "easy" and some of them probably not even necessary. Even if many details are not realistic (some may not even be physically possible), this is not science fiction either - he did extensive research into many technologies to flesh out the plans with details that at least aspire to practicality - with some examples succeeding more than others. His early plan includes building floating colonies in tropical waters and using OTEC's (ocean thermal energy converter) to extract energy from the temperature differential between deep water and surface water. He proposes that such colonies could become self-sufficient and eventually even generate surplus energy and food (from mariculture) for export. The foundation that sponsors the development of these ocean-based colonies would use the profits and the knowledge gained to move on to colonies in space, on the Moon, and on Mars, and eventually beyond the solar system. 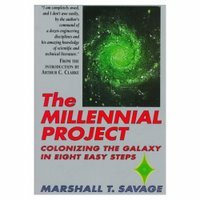 Would people join such a project as residents of ocean-based colonies, space colonies, etc.? I don't know - there are social and political implications here too of course. Savage certainly has a utopian agenda. I haven't read the whole book yet, in part because I am both impressed and skeptical. I'm probably most impressed by the fact that he has taken the long view and developed and documented such a boldly optimistic plan, whether it's practical or not. So I guess I need to suspend my disbelief on such things as his "Bifrost" (Earth-based mass driver) space launch system and just read the whole book for its scope and optimism. I read an essay by the planetary scientist and space artist William K. Hartmann in a book I got recently, Worlds Beyond (The Thrill of Planetary Exploration, 2002, edited by S. Alan Stern, the principal investigator on NASA's New Horizons mission to Pluto). This is a very interesting book because in it, ten planetary scientists talk not only about their work, but about how they got interested in planetary science in the first place, and what it is they are most excited and curious about. Hartmann is an especially interesting case - a planetary scientist who has done important scientific work (e.g., he was one of the originators of the now generally accepted theory of the Moon's formation as a large chunk of the early Earth's mantle ejected in a collision with a Mars-size object) but who has also painted many detailed, scientifically accurate, and attractive paintings of astronomical and terrestrial subjects. His paintings have appeared in many books and museums. He is also the author of the excellent Traveller's Guide to Mars (which I have) and other popular science works, not to mention a SF novel (Mars Underground) which I have not yet read. Quite an impressive resume and gallery! I've just ordered a used copy of another book co-written and illustrated by him, The Grand Tour (A Traveler's Guide to the Solar System). The Hartmann painting above shows an asteroid approaching Earth. Hartmann believes that while science depends on details, it's also important to keep the big picture in sight - and his paintings help us do just that. The quote above is taken from a fictional work of inspirational poetry by the main character of the two Parable books, Lauren Oya Olamina (Butler wrote the quoted passages from this fictional work, many of which are collected here) . She starts out as a 16 year old African-American girl in suburban Los Angeles circa 2027. Global warming and other severe problems have led to a near-total breakdown in American society, and she and her family live in a walled neighborhood surrounded by poverty and chaos. Her neighborhood is finally destroyed and most of her family and neighbors are killed, but Lauren manages to escape and to make her way to northern California. Along the way she helps, is helped by, and starts to gather a group of people with whom she later builds a small, self-sufficient community called Acorn. My Piece of the "Long Tail"
File this one under "shameless self promotion" (but I won't create a topic label for that). 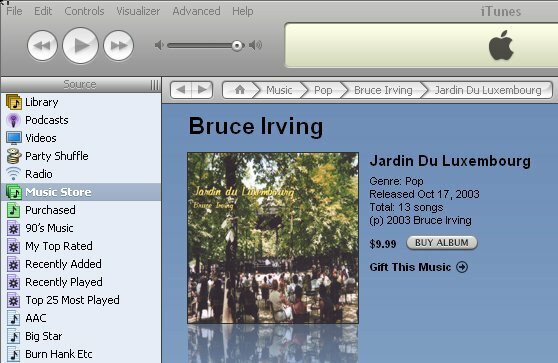 I got an email from CD Baby, which is the independent artists' music site through which I sell my CD Jardin du Luxembourg. It was a reminder on how to use direct links to popular digital download sites to promote your music on the web, since many people today prefer to download songs rather than buy CD's (which of course you can still do through CD Baby). That's one of the nice things about selling through CD Baby - they take care of getting your songs to dozens of digital download sites automatically, and they even send you reminders about how to use this to promote your music! So if you have iTunes, you can get to my page at the Apple iTunes Music Store here, or if you prefer eMusic.com (which specializes in indie music), you can go here. Both sites have 30 second previews, though you can hear much longer previews at my page on CD Baby itself. I guess this is my little contribution to the "long tail" that the internet makes possible - all the zillions of obscure, low-demand, and specialized items that no physical store could possibly afford to stock but that you can now locate and buy on the web. I find it kind of ironic that my best seller in digital downloads is a song I wrote a few years ago for my younger daughter, called simply enough, "Daddy's Little Girl." Although the lyrics are personal and specific, people must like the title, and then presumably like the song when they preview it (at least enough to spend 99 cents). I've made a few hundred dollars from downloads of that song - so if you bought it, thanks! I'm just finishing an excellent book, Before Lift-Off: The Making of a Space Shuttle Crew by Henry S.F. Cooper, Jr. I file it under "space history" because it documents the crew training and the actual flight of the shuttle Challenger on STS 41-G which took place October 5-14, 1984, twenty-two years ago this week! Under the command of space veteran Robert Crippen, the crew of seven was the largest crew to fly to space up to that point, and the first to include two women, Sally Ride and Kathy Sullivan. They deployed a satellite, took radar images of the Earth's surface, and performed an EVA to test the feasibility of in-orbit refueling of satellites (with real hydrazine!). 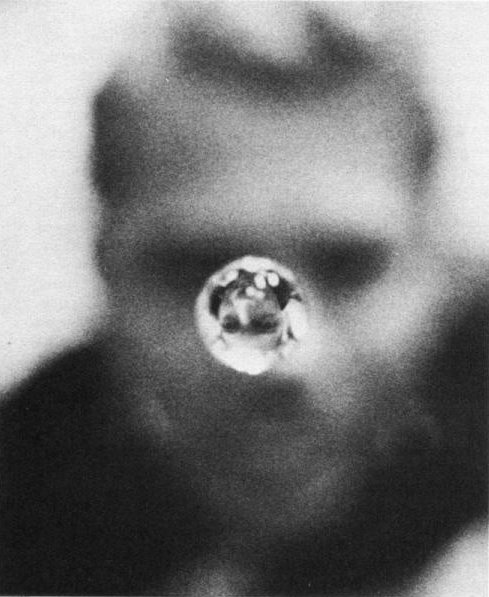 The photo shows a little optical connection - a picture of astronaut Dave Leestma's inverted image in a perfectly spherical zero-G water droplet, with Leestma himself out of focus in the background. To write this book, Cooper was given regular but limited access to the crew through the many months of training for the flight, and more extensive access to the trainers who worked with the crew in hundreds of "sims" or simulations of various kinds. The shuttle was (and is) a complex vehicle, with hundreds of interacting systems and procedures to learn and practice. The many different types of simulators allowed the crew to learn how to operate each system and how to work together as a tightly integrated team. The trainers would generate a steady stream of simulated "malfs," "glitches," and "nits" to teach them how to recognize and recover from the many ways that the complex systems could fail. The complexity and depth of this whole process is really impressive and requires tremendous dedication of everyone involved. When I "fly" a simulated space shuttle in Orbiter, as cool and realistic as it is in some respects, I know it's just the tiniest tip of the iceberg in terms of what's really involved in shuttle missions. When I saved my last few posts, I noticed that Blogger was running a beta of a new version of their blogging software with some pretty cool upgrades. So I've given it a shot - actually more than that - since you can't go back, I'm committed. But it looks good so far. Mainly I couldn't resist the lure of topic labels. I've actually toyed with the idea of moving my blog to Wordpress or another service that offers more control and features, especially the ability to assign topic labels that would allow readers (and me!) to more easily find previous posts with related themes. I read posts and articles about the moving process and it didn't sound like much fun. So I procrastinated, and for once, it paid off. There are new templates (I've kept my dots for now) and various new features on the editing side (like practically instant publishing when you write or edit a post). But the most visible new features are the expanding year and month blog history labels (click the triangles to hide or show the months or posts below), and the topic labels list, which allows you to display all the posts that I've labeled "Mars" or "Orbiter" or "add-on." Cool. So far I have labeled about 60 of my two-hundred-something posts, trying to keep to a relatively small list of keywords. I'll probably finish this up in the next few days. to find something-specific. And you can too. I really like the brief Quicktime video found on this page. The page is part of the small personal web site of Dr. Bradley Edwards, the scientist who has done more than perhaps anyone to make the idea of a space elevator seem like a serious prospect for the near future. This short video clip gives you a quick idea of the mind-boggling possibilities. 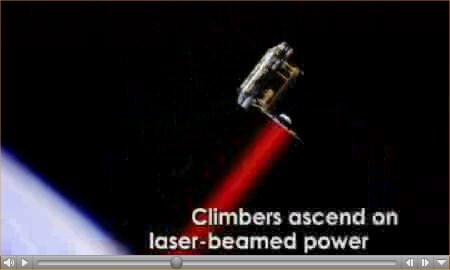 I think it's especially cool that there's a big optical connection here - space elevators will run on power beamed up to them with high-power lasers using adaptive optics. Here is another brief video (2:08 WMV) that explains the space elevator concept in simple terms. I read Edwards’ book The Space Elevator about a year ago (discussed here, here, and here), just after I started this blog, and I was impressed with the scope and depth of analysis he had put into that book, which was the result of a second-stage study sponsored by NASA’s Institute for Advanced Concepts (NIAC). There are certainly challenges, but it seems they are mainly engineering challenges, including the big one of producing carbon nanotube ribbons of sufficient real strength (the theoretical strength of CNT’s is more than sufficient, but there have been questions raised as to whether the required strength can really be achieved in a ribbon of some 100,000 km in length). I said mainly engineering challenges, not merely engineering challenges. In about a week, at the X Prize Cup 2006 in Las Cruces, New Mexico, the Space Elevator Games will draw more attention to the prospects of a space elevator as teams compete in two events, the Power Beam Challenge and the Tether Challenge (both part of NASA’s Centennial Challenges program, each with a $200,000 prize, a prize which will grow in value over the next few years). Triggered in part by these upcoming challenges, there has been a lot of activity on the web, and some new publications. Web sites include the Space Elevator Reference Blog (edited by Dr. Edwards) and the Space Elevator Blog (official blog of the 2006 games), and the website and staff blog of Liftport Corp. I have not yet read any of the new publications, so I can’t really comment (I’m about to order and/or download a couple), but you can find information about them at the blogs and web sites noted above. From what I have read, I do believe space elevators can be designed and built in the relatively near future. Whether that's 10, 15, 25, or more years, I can't say. Maybe there are some showstoppers that will make it much harder than many now believe. But when it arrives, it will revolutionize our access to space. I hope I'm around to see it, and maybe even ride it. 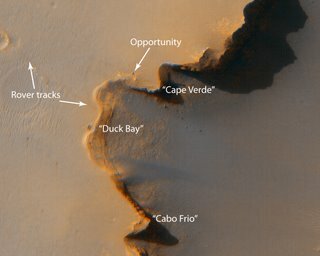 NASA held a video briefing today with key people from the MRO and MER (Mars Rover) teams to show off some amazing images and to discuss the synergy that is now possible with high-resolution orbital imagery from MRO and "ground truth" from the still active Mars Rovers (story here). The Rover Opportunity recently arrived at the 800 meter crater "Victoria" after a long journey. Three days ago, the MRO team used the HiRISE camera in its first "off-nadir" test - meaning they pointed the camera to one side of MRO's orbital path rather than looking directly below. The target was "Victoria" crater, and the detailed image showed Opportunity sitting on the edge of the huge crater! More pictures here. The MER team also showed new images, including sections of a color panorama of Victoria crater that was NASA's Astronomy Picture of the Day on October 2. In unrelated astronomy news, NASA also announced new findings from the Hubble Space Telescope, the discovery of sixteen new extrasolar planets detected in the vicinity of our galaxy's center. Centauri Dreams has a nice discussion of these findings. -Bob Dylan, "I'll Be Your Baby Tonight"
This is not one of Dylan's most profound or original lyrics, but tonight it's really true. 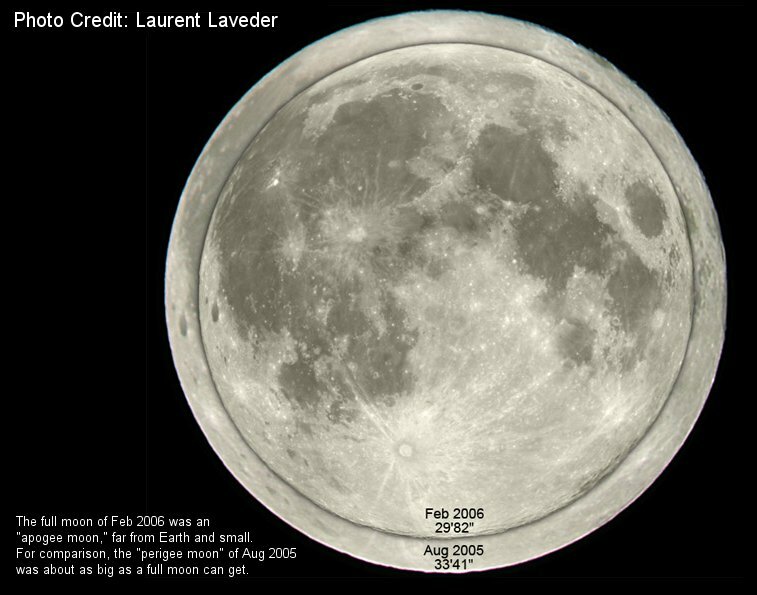 Today the Moon is at perigee (closest point in its orbit), and tonight's full Moon will also be the Harvest Moon (the full Moon closest to the autumnal equinox). 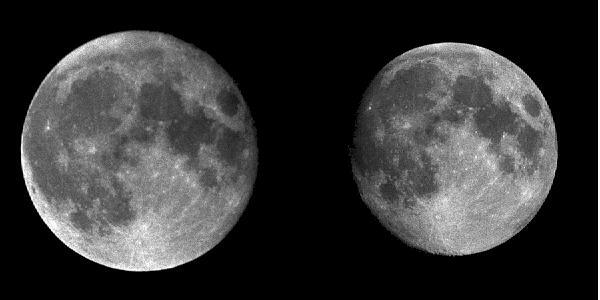 Because it is also so close to perigee, the full Moon's apparent size will be 12% larger than that of the apogee (maximum distance) full Moon of February 2006 (here's a visual comparison). This article explains all this (and more) in some detail. This NASA article from 2005 talks about the Harvest Moon with a Martian spin, and this more recent one discusses some interesting things about the light from the Moon. It's a beautiful autumn morning in New England. 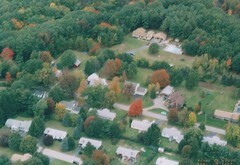 The sunny blue skies and the leaves just starting to change colors are leading me to think about how much I miss flying. Not the commercial passenger kind (I still get plenty of that), but the low-and-slow kind in a little airplane like a Piper Cub. There's no better way to see the magnificent fall foliage, but unfortunately I'm not flying these days. I started to get back into it in the summer and fall of 2004 with some tail-wheel endorsement lessons in a Piper Cub, but weather and scheduling got in the way and I didn't complete the tail wheel thing, which was really a bit of nostalgia since a Cub was the first airplane I ever flew in, back when I was a kid in Civil Air Patrol. Summer and fall of 2005 were obsessed with Orbiter (I had discovered it in March and by summer was working on writing Go Play In Space). 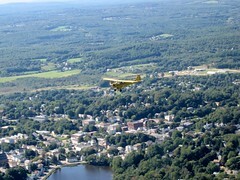 So now it's another fall and I'm thinking about flying again (summer would have been a more practical time I suppose). Maybe I'll sign up for a few refresher lessons in a Cessna 172 and get current again. At least go up a few times and have a look at the leaves before they all fall as they so quickly do. The flood of imagery and data from NASA's Mars Reconaissance Orbiter (MRO) has started, and there are some great pictures from the HiRISE camera available on-line. The picture shown here (from the HiRISE blog) compares HiRISE imagery of a crater with imagery of the same area taken by Mars Global Surveyer, until now the highest available resolution imagery of Mars. The difference is beyond striking! The best way (so far?) to view the HiRISE imagery is with a Flash application called Zoomify that is available on the HiRISE web site, so far with 11 HiRISE Mars images. When you use your mouse to zoom in and pan with this application, you soon get to a point where the image looks pretty detailed. Then you zoom in some more and see features as small as ~1 meter -- detailed views of all sorts of features such as a field of rocks with clear shadows as in this image. Amazing stuff. 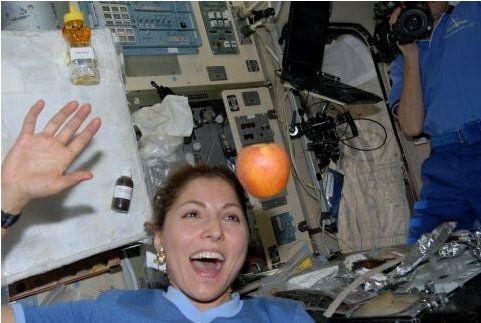 I've mentioned Anousheh Ansari's "space explorer" blog several times already. Since returning from the ISS, she has continued to write in her informal, open, and honest way, and people around the world have continued to post comments. Yesterday she wrote a post titled "I couldn't sleep" in which she talked about being pleased with the success of her blog in reaching people, but admitted that some negative or critical comments, as relatively few as they have been, have been discouraging for her. This comment has triggered a "silent army" of blog readers to come out and post encouraging notes and stories of their own inspiration (247 comments so far). It's really amazing to read these comments from people in Iran, Malaysia, Russia, the US, and many other places. There are many worthwhile things being said about working for the future, international cooperation and understanding, the value of hopes and dreams, and more. Here is one message (#227, no indication where the writer is from) that I found especially hopeful - a direct example of the kind of inspiration that many space and education advocates are trying to achieve, and that Anousheh actually is achieving. Please don't take these negative comments to heart because what you have done is absolutely amazing. You may not believe it but you have completely changed my life, I have always wanted to go into space and am at college on a course that i hoped would help me get there but a few months ago started to have second thoughts about the whole thing, especially because i am the only girl and surrounded by men who think that i am incapable of doing well for myself because i am a girl but after reading your blog and how you want "To inspire youth, and especially girls, around the world to pursue their dreams", you have helped me become determind me to carry on but this time with more enthusiasm and drive to succeed. You are amazing, thank you so much. Andy and Mark are getting the Mars for Less add-on ready for release, and I'm back to doing some testing. Our new Mars entry orbit takes us down the length of Valles Dao and really looks cool. Andy has also posted our technical paper (300 kb PDF, from the Mars Society Conference in August) on his Mars for Less web page.